EAST VILLAGE — Ronda Locke, who worked as a staffer to Ald. 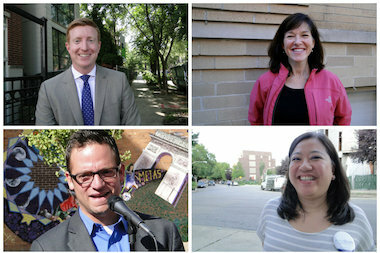 Joe Moreno (1st) during the first two years of the Wicker Park alderman's political career, has become the third candidate hoping to upset him in February's municipal election. "I'm coming at this from a decade of volunteering and working in the community and from a servicing perspective," Locke said. Locke, a mother of two daughters who describes herself as a full-time community volunteer, is involved in the Local School Council at LaSalle II Magnet School, 1148 N. Honore St., as well as East Village's Commercial Park, 1845 W. Rice St.
Andrew Hamilton (from l.) , Ronda Locke, Anne Shaw and incumbent Ald. Joe Moreno (1st). Locke, an East Village resident, announced her plans to run against Moreno in an email to her network of friends and community members late Friday afternoon. Locke plans to officially file her candidacy soon with the Chicago Board of Election Commissioners. Two other candidates are competing for the 1st Ward alderman post. Anne Shaw, an East Village resident and attorney who founded Shaw Legal Services, and Andrew Hamilton, also an attorney, both kicked off their campaigns in late August with door-to-door outreach efforts. Shaw ran against Moreno in a 2012 ward committeeman race but lost to him, getting 27 percent of the vote compared to Moreno's 57 percent. By Nov. 17, each candidate must collect 479 signatures from registered voters, a requirement to be put on the ballot in the city's 1st Ward. The ward encompasses parts of Wicker Park, East Humboldt Park, Ukrainian Village, East Village and Logan Square. Locke said she was in the process of forming an election committee and said a website was forthcoming. Locke said if elected alderman she would put the community first, be a full-time independent representative, advocate for a representative [elected] school board; and prioritize public safety. Locke previously spent 17 years in corporate brand marketing before leaving her full-time job to start a family with her husband Peter Locke. Locke met Moreno in 2010 after he was appointed to the alderman role following predecessor Manny Flores' resignation to serve as chairman of the Illinois Commerce Commission. Locke said she helped to collect signatures to put Moreno on the ballot in the February 2011 election, when he garnered 74 percent of the vote. After he was elected, Locke worked in part- and full-time capacities as a community outreach liaison in Moreno's office until September 2012, for about 18 months, before resigning during the Chicago Teacher's Union strike. Locke said she believed the decisions being made by Moreno were not "committed to community first" and that if elected alderman she would commit to not accepting developer donations. Moreno receives donations from developers but said the money goes back into the community, including to projects that Locke has spearheaded over the years. "Whenever Ronda Locke has asked me for money, it has been thousands and thousand of dollars. For LaSalle II [playground renovations completed in September], she never once asked me where I raised the money, where the money I made out to her personally and paid to her out of my political fund for special projects came from," Moreno said. "I have raised thousands of dollars and I am proud of it," Moreno said. Moreno said he had no comment on Locke joining the race outside of, "Anyone is free to run." "I am very confident in my abilities and organization and proud of my record and will work as hard as I can to win this election," Moreno said. At the beginning of her outreach efforts, Locke said she has "about 10 volunteers with clipboards" who are helping her to collect signatures. As of late Sunday, Locke said she had gathered about 300 signatures. Reached Monday, Shaw said, "We are excited to have anybody who wants to run in the race right now. We are concentrating on making sure that we talk to every voter as many times as possible. Things are going great and I have had positive responses from the many voters I have met." For his part, Hamilton, who said he had a "great turnout" at a fundraiser Monday at Las Islas Marias, 2047 N. Milwaukee Ave., said, "The more people involved [in running], the healthier the debate." View Shaw's website, Friends for Anne Shaw, here. Visit Hamilton's website, run by Friends for Andrew Hamilton, here. Find out if you live in the 1st Ward (or another ward) by typing in your address here. The aldermanic election is Feb. 24.